Why did I ever skip you and deem myself unworthy to enjoy you? You really light up my day. You make morning workouts more enjoyable. You challenge me to make you quick, but still delicious. You sometimes taste like cake. Awesome. Sometimes you taste like pie. Yes. Your breakfast fan for life. Ok, that was a bit weird, but 3 cups of tea before 8am will do that to a girl. I used to be a chronic breakfast skipper for most of my life and I felt like crap. After a while, I had to ask myself if I really wanted to live my life this way and I knew the answer, but it took a long time to break the habit. Now, I can’t imagine my life without a healthy breakfast to start my day. My workouts are stronger, I have more concentration, and I’m a much nicer person to be around. Trust me, you don’t want to be around me when I’m hungry all the time. It ain’t pretty. If you saw my post several weeks back on Raw Buckwheat Breakfast Porridge you may know that I’ve been stuffing my face with this stuff each morning. I went on a 3 week daily feast and then I ran out of buckwheat groats. Note: I like to make this at night and then it’s ready for me when I come down for breakfast! 1. In a bowl, pour 2 cups of raw buckwheat groats (not Kasha, but RAW groats) and 4-5 cups of water. Soak for at least 1 hour or overnight. After soaking, rinse well in a strainer several times. Grate carrot and set aside. 2. Place buckwheat groats (reserving 1 cup) in food processor or blender, along with the almond milk, chia seeds, and vanilla. Process until combined and slightly smooth. Now add in the sweetener and spices to taste (I found 1/4 cup of sweetener was enough, but others might like a bit more or less than that). Transfer to a bowl and stir in the grated cup of carrots and the reserved buckwheat. Adjust sweetness to taste. 3. Scoop into bowls or parfait glasses and add your desired toppings & mix-ins. Serve immediately cold. Place leftovers into fridge and enjoy for the next few days. Makes 3.5-4 cups depending on how much milk you use. For step-by-step photos, see this post. I process only half of the buckwheat and then I stir in the rest at the end. This results in a nice chewy texture that I love. I really can’t be left alone with this stuff. It calls out to me from the fridge. Add a dollop of maple syrup on top if you really want to take it over the edge. Incredible! and good to the last drop. I’m feeling in a 2 for 1 kinda mood this week, so here is another fun little snack that I enjoy. And by enjoy, I mean obsess over and eat daily. I’ve been eating this so much, I figured it was silly for me to keep it a secret from you. Just don’t buy all my Kamut Puffs though. We’re already nearing a shortage in my grocery store! Special thanks to Angela for introducing me to this stuff. Just like Cocoa Puffs, only without the crap. Pour a bowl of your favourite puffed cereal. 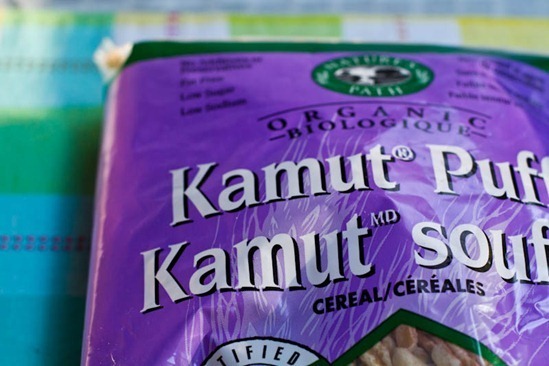 I’m in love with Nature’s Path Kamut Puff cereal. Add 2-3 tbsp carob powder on top. I buy it at Bulk Barn. I’ve also seen it called Carob Flour too, in case you see that somewhere. Pour on non-dairy milk (I use Vanilla Almond Milk) and mix well until clumps are gone! A knock-off of Cocoa Puff cereal, without a boatload of sugar and processed ingredients. Carob Power is naturally sweet, but only has 15-20 calories per tablespoon and it’s filled with fibre. Now take note, it’s about as filling as eating puffed air, but it’s awesome for those times when I crave something sweet or chocolaty and don’t want a ton of sugar. PMS, I’m looking at you. Plus, it’s basically air which means you can eat approximately eighty-five bowls in a day. Ninety-five if you are PMSing. Vegan Recipes and a Glo Bar Giveaway! Both look ammmaaazz-ing! I made the buckwheat cereal the first week you wrote about it (I can’t find Buckwheat Groats (i tried bulk barn but no luck-where do you find yours as I think we live somewhat close-me, in Mississauga/Brampton area) so I jused plain buckwheat to great success. One of my fav breakfasts so now I must try this. Thanks again and again and again Angela! Yay! You and these altered cocoa puffs are awesome. You so do not need an intervention. I am SO trying this tomorrow morning! You rock with your recipe ideas Angela! Oooooh love the carob puff cereal thing! I just want to drink the milk out of that bowl! Yummm! I really want to try buckwheat groats. This recipe is on the top of the list! I love breakfast and cannot go without it! I love it when breakfast looks like dessert! And it has carrots in it. I’m sold. Angela, I love your blog so much! :-) Both recipes look delicious! Do you think I could do the buckwheat groats recipe with regular oatmeal? Maybe do the overnight oats thing and just add the same toppings? I def want to branch out and try more grains, etc., but I need a spare second to run to the co-op for supplies! :-) THANKS!! I can’t see why not. I’ve made vegan overnight oats carrot cake before. 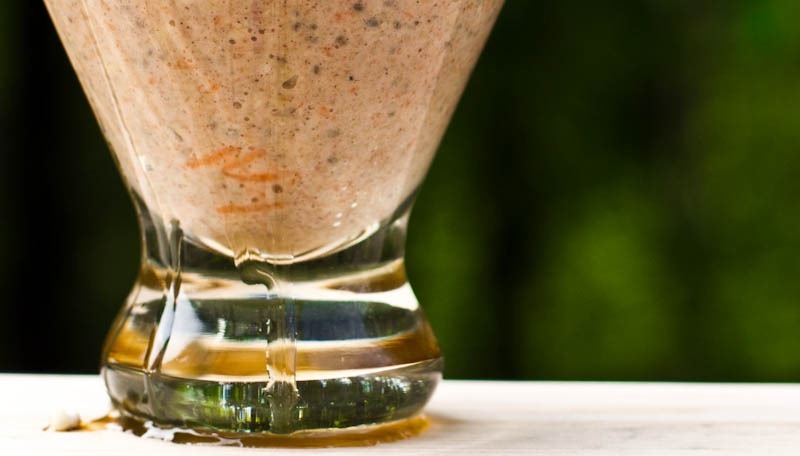 You might need more liquid if using 2 cups of oats as it will soak up quite a bit. Let me know if you try it out! My secret is that I make it at night before bed…and it’s ready in the AM. :) Fool-proof! Yes, and leave enough Kamut Puffs for me too! You weren’t kidding when you said you were working on a new flavour – these 2 recipes appeal to me a LOT (and that’s no wonder, because you know I love carrots and kamut puffs!! :) Have a wonderful day, Ange! Yum Carrot Cake for breakfast! Sounds fabulous to me! I just love your site and how open you are about discussing your past. You truly are an inspiration! Thank You! 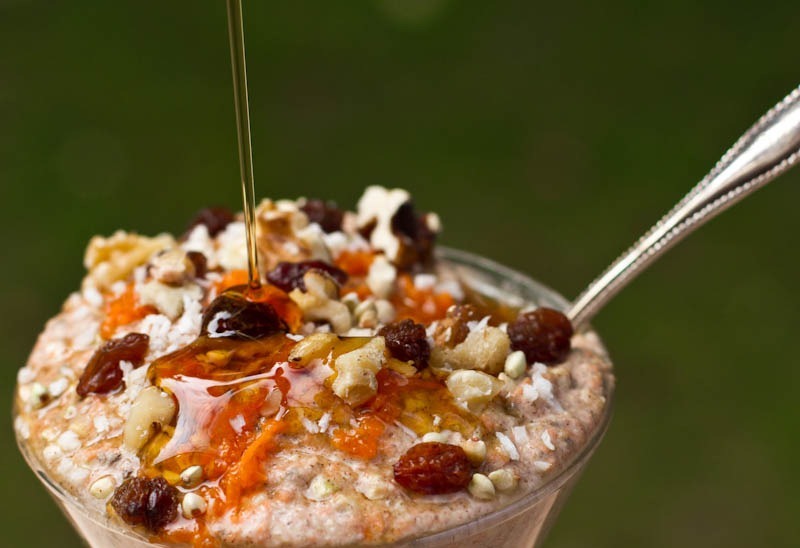 your carrot cake buckwheat porridge looks UN-believably scrumptious. i’m in awe right now. 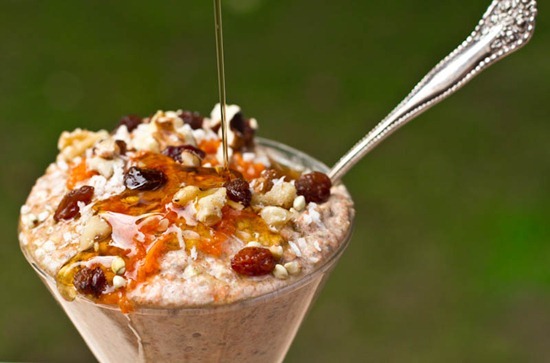 This Carrot Cake Porridge is more like it! I looooove carrot cake! This might be pushing you into dangerous territory, but you can buy a 12 pack of the Nature’s Path Organic Kamut Puffs Cereal on Amazon….. I am nearing end of my buckwheat groats too…waaaaah. This looks amaze, I wonder if you can make a cake batter flavor with vanilla protein and sunflower seed butter! I loved your original buckwheat porridge recipe and considering carrot cake is my fav dessert I can’t wait to try this one! omgggg breakfast is seriously my favorite meal of the day… I love the maple syrup dripping down the sides it looks to die for! Girl you are the queen of fancy breakfast and I think I love you more for today’s breakfast delight :) This looks FAB!! Thank you again for another wonderful recipe!! Keep inspiring dollface! I can’t believe I used to skip breakfast either! Now I look forward to it every morning… I just love the quietness and peace of a morning and sitting down with a delicious and healthy meal is such a pleasure! 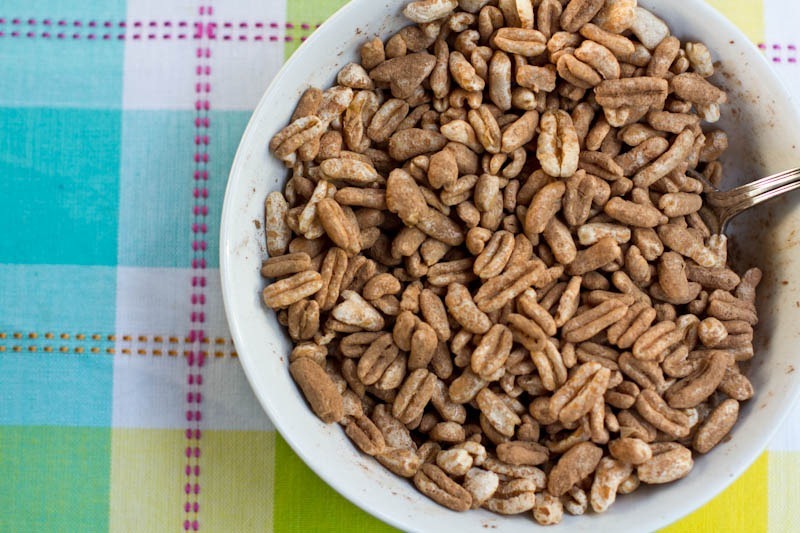 Your buckwheat groats sound so good! I need to find raw buckwheat groats though… I may just try making an oat version until I can track those down! I can’t imagine skipping breakfast! But I used to do the same thing. I would eat just sugar free jello and then go work out. I didn’t feel well at all. UGH! I second what Kris said… only I’d add: “You are the queen of fancy” [but still super fast!] “breakfast”! I’ve never been a carrot cake fan, although I l-o-v-e carrots… But if it’s a recipe by you, it’s definitely worth a try. Everything else has turned out delicious… And besides, I’ve loved buckwheat since discovering it a year ago, and the buckwheat porridge idea is genius! How funny that you like Kamut Puffs too! I’ve been using them to replace rice puffs in recipes that call for them. :D I think they either have a little more protein or a little bit more fibre than rice puffs?! Can’t remember. I wish there were a way to puff Kamut groats or millet at home! I have been drooling over this since you posted the picture on FB yesterday!! 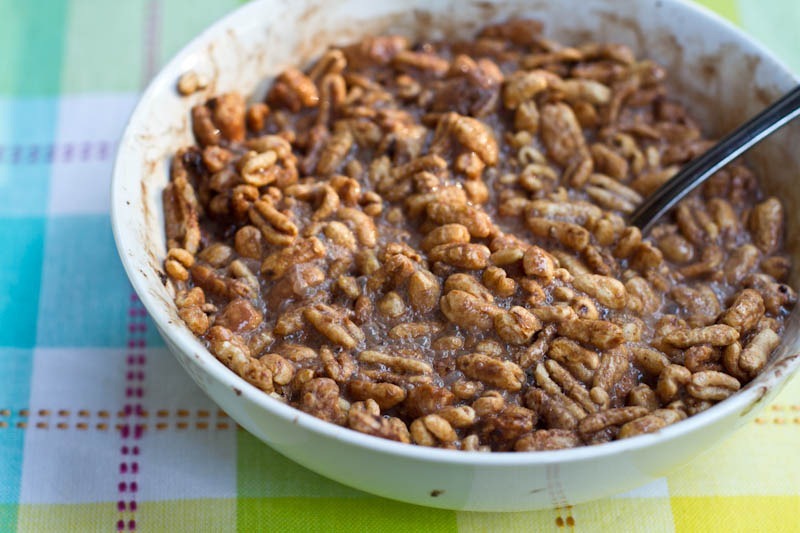 The texture of the buckwheat porridge totally looks pudding like…which begs for a chocolaty, cocoa, almond version. I know what I’m eating tomorrow morning! You’re breakfasts are always so pretty! I just read your breakfast post, and I totally used to do the same thing with half a packet of oatmeal! I am freaking out. Gorgeous! Just love your pictures and will be making this buckwheat breakfast soon! haha those 2 for 1’s get ya eh? You need your own cooking show, this stuff is amazing! I’m so glad you showcased kamut puffs! I actually bought some on a whim the other day! I can’t eat it yet since I’m on a gluten-free/soy-free/dairy-free/corn-free elimination diet, but I plan to make it part of my “light gluten” introduction day! I am so angry that I used the last of the almond milk yesterday! I want the carob puffs NOW! I’ve got my almonds soaking as we speak for my first attempt at homemade almond milk though. So excited! Wow, this page with those beautiful photos made me very hungry! I have bought the kamut puff cereal, but never thought to add carob powder. Good idea, as the cereal is a little bland on it’s own. Um…I want breakfast at your house. lol That looks absolutely amazing!! Amazingly I HAVE kamut puff cereal in my cabinet right now! I thought about making a similar version (with dark cocoa powder instead of carob) last night for “dessert” but made some beet cookies instead..
That buckwheat porridge looks fab, too! I love your carrot cake oatmeal so I bet this is yum! 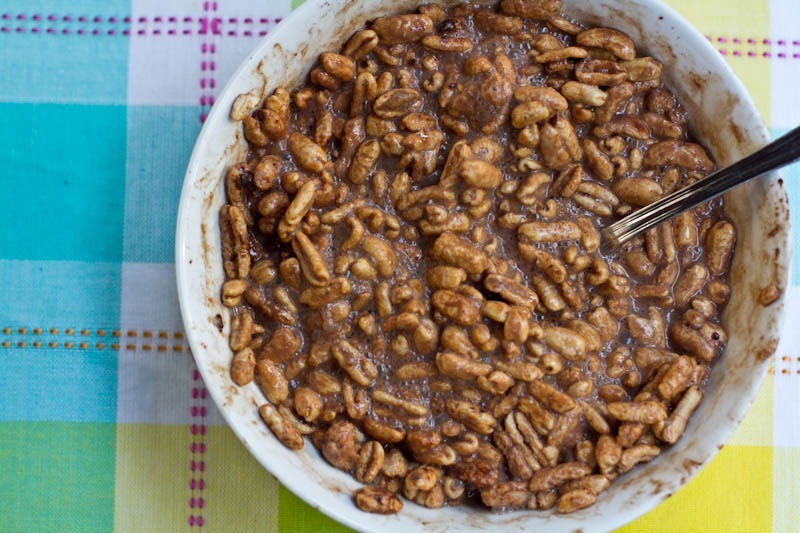 OMG this carob puff cereal is genius! I am totally making that for brekkie! Gonna use millet puffs instead and see how that works. I need to re-up on buckwheat groats so I can try your other recipe too. It looks ridonc. Thanks Ange! Good to know they sell it too!! See this is why I love you, you make it ok to have chocolate (well carob but it tastes and looks like chocolate to me) for breakfast. I used to skip breakfast and wonder why I wasn’t very productive in the mornings. Ever since I started having breakfast, I’ve found that I am in fact a morning person, I just need fuel to get started. Funny that! I also discovered that Im a morning person since re-introducing breakfast :) Funny how that works, eh? Please let the next hour go by quickly as I wait for my buckwheat to soak. I’m such a breakfast person, too! It’s my absolute *favorite* meal – and those look super, super yummy! Also, I just discovered kamut ( http://livinglearningeating.wordpress.com/2011/08/08/flaky-fantastic/ ) but in tasty flake form. Could the puffs possibly be as tasty…? I love your website! I have a question about the Maple Syrup you use. I’m from Texas so when you say Maple Syrup I’m envisioning Mrs. Butterworth and I know that’s not right. What kind do you use? I use 100% pure maple syrup :) Usually grade 2, but the key is that it’s pure. 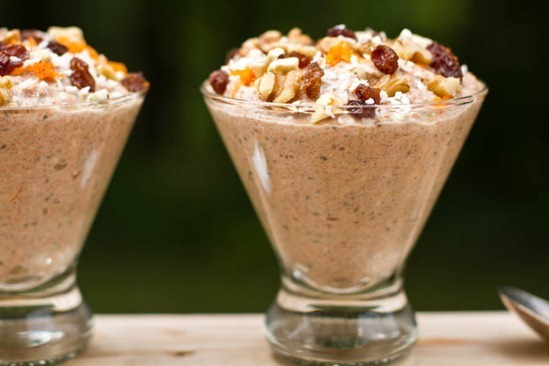 Wow these parfaits are gorgeous! Need to make these stat. Thanks for the great ideas, as always! Oh and PS I am excited to hear whatever “news” you will be sharing with us….. soon. And bummed that it isn’t yet baby related =( I just had my first. I am slowly but surely getting more comfortable with eating breakfast. I used to skip it all of the time too… filling up on water and carrot sticks. I am now understanding how dang important this meal is!! As always, looks amazingly yummy Angela! 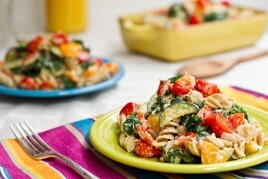 Can’t wait to make this for the fam, or maybe just for myself :) Carrot- coconut is one of my favorite combos. 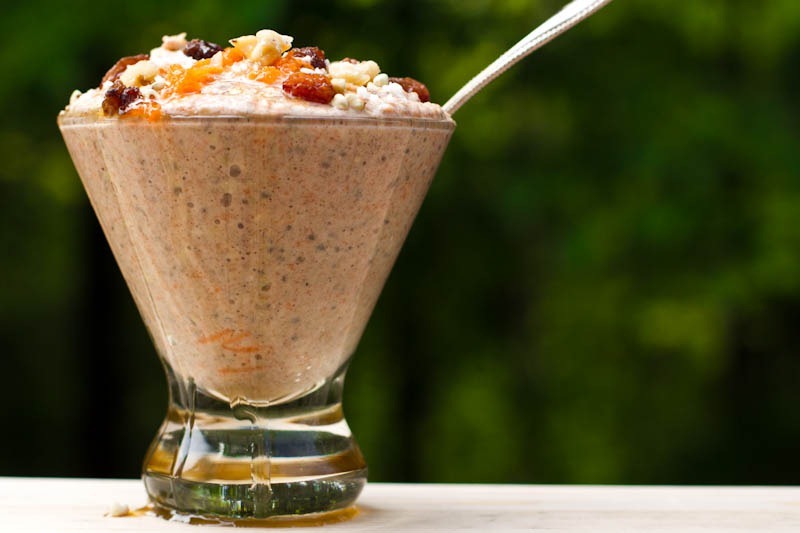 What fun it will be to further get creative with this buckwheat porridge! Okay, this is not related to this lovely post, but I just saw that you’re Glo Bakery is up for a Veggie Award on Veg New’s site for best online bakery?? I voted for you!! I’ve been doing the same thing with Kamut Puffs, except I use Chocolate Protein Powder!!! LOVE IT! 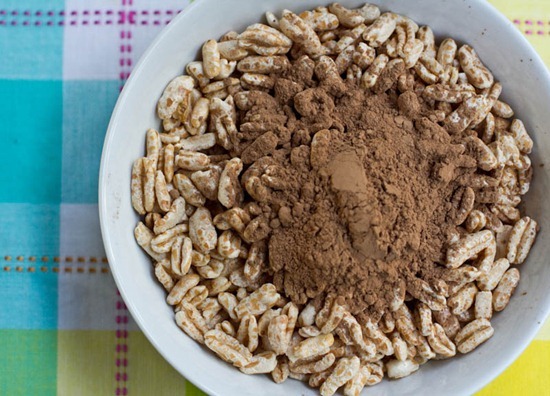 What an awesome idea to add carob powder to Kamut Puffs! I can’t wait to try that…maybe it’ll help end my obsession with cocoa puffs. I really want to try buckwheat groats again but last time they were so horrible! I made them similar to quinoa and the texture AND flavor were really awful. I mean AWFUL. Do you promise they’re better this way? I thought the same when I first tried them too, until I realized that they were kasha grouts (roasted version and absolutely disgusting!). ^^ Agree about kasha. I hate buckwheat toasted or cooked usually! Raw buckwheat groats have a much more milder flavour. Thats why I love them in this raw no cook version. I make it the night before- it takes me 10 minutes to whip up, no joke. Oh my. You did it again. 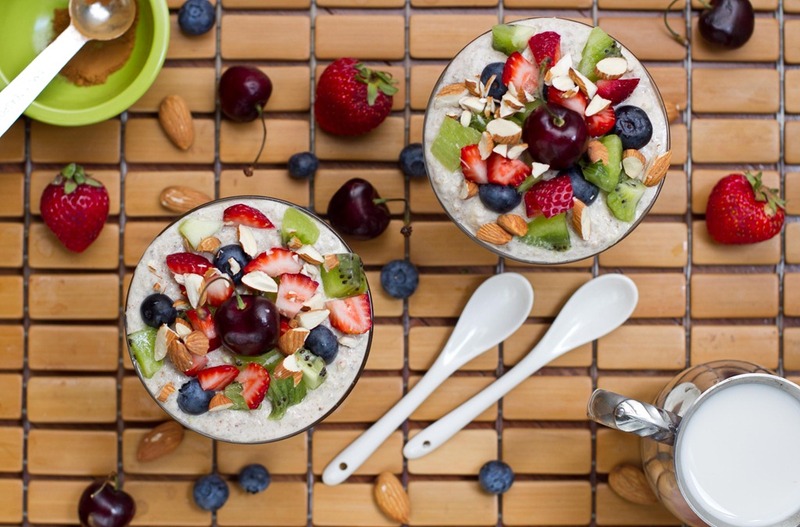 That buckwheat porridge seems like a little bit of heaven! And thpse Kamut Puffs look delicious too! I’m glad you enjoy your breakfast every day now :). I still haven’t tried this, gah I have to! We love buckwheat at our house, and so do the puppies! These sound great. I’m always looking for healthy substitutes for my kids, I think they’ll love the Cocoa Puff knock-off! Just found your site, love it! I’ve been hoarding buckwheat groats for so long and M glad you have now provided me with a great way to put them to good use. Do they go bad after a while, or would they still be good if I stored them in a ziplock for 2 years? I love your creative breakfasts! Can I just tell you how much I loved this post…not only for the amazing faux coco puffs ;), but the part about skipping breakfast and the way it made you feel resonates with me so much. Every part you described about how it made you feel and eating nothing while working out so intensely, I totally relate to that and used to do that to a T.
This is such an awesome breakfast idea. Yum! Oh Wow, 2 Fantastic Breakfasts’… what did we do to deserve this! what a treat and I have everything to make both, woohoo! Thanks Angela! Breakfast is my favorite meal for sure. I love your honesty, I could not imagine skipping it! I love those Kamut Puffs too! They’re a great topping for yogurt, or as part of a trail mix, to add bulk. I just love the crunch! BAH! I have seriously been craving chocolate the past few days. Get me to the Kamut Puffs.. stat! This is my favorite recipe post of yours EVER! Right from the title I knew it would be! You basically covered all my favorite foods!! 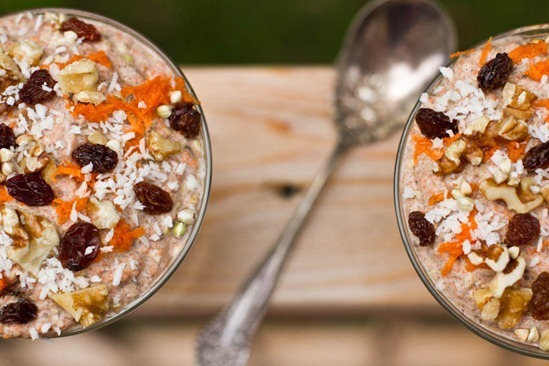 I already love your buckwheat porridge…but carrot cake flavor just takes it over the top! And I am totally the CAROB queen!! I put it on everything!!! This dish is going to make me start eating breakfast…5 times a day! What a gorgeous photo. I am literally salivating over here! Bravo. These look fantastic! Though I usually start my day with a smoothie, I would definitely cheat on my green monster with these babies. Yum! I JUST bought those exact kamut puffs at Whole Foods today, then read that post about an hour later!! So then I just had to have a bowl of kamut puffs with chocolate milk for dessert. I’m going to give this a try sometime. I really, really love buckwheat. Last time I went shopping, I bought five bags of it. I try to eat it every morning for breakfast because it makes me feel really good. I really feel like it enhances my mood somehow. 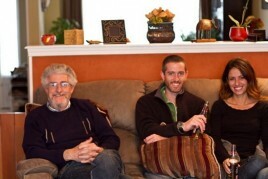 Maybe it’s the tryptophan in it? That converts into 5-HTP, and then into serotonin. It also contains B vitamins, which are good for the mood. I like to eat the groats whole because they have a neat texture, but I’m going to give this a try sometime. It looks fun and tasty! Mm that all look soo good! I love carob. To this day your carrot cake oats are my favorite breakfast! I recently discovered you can also make bulgur raw and have been soaking it for 15 mins for breakfast. I’m going to try it carrot-style now! MMMMM, buckwheat is soaking. Can’t wait to try this for breakfast tomorrow. 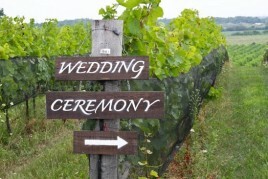 BTW, you looked beautiful at the wedding. This recipe looks amazing! I love your hot carrot cake oatmeal, so I’m sure this is just as good. I’m so glad I finally found raw buckwheat groats at the Oakville WF. Love this combo, i sometimes use raw Caoao powder, Nature’s Path rice puffs, and drizzle a little maple or yacon syrup over the mixture. Tasty treat! Love Almond Breeze Almond Milk – big fan for the last 5 years. I just discovered puffed kamut last week :D I’ve added it to my collection of puffed cereals. It’s winning as the best of the lot at the moment! This post just made me extremely hungry. That buckwheat porridge looks awesome! I will most definitely be making that very soon. The carob puff cereal reminds me of the days when I used to be addicted to Cocoa Crispies cereal, the one that turned the milk into chocolate milk. This looks like the perfect fix for a not so healthy, but much healthier than the alternative, treat. Breakfast is most definatley the best meal of the day! Oh my god, that looks and sounds delicious! If I hadn’t run out of soymilk today I would totally be making these for breakfast tomorrow!! uh those pictures looks just yum! first I thought those are the carrot cake bites, which I discovered in the blogworld and am just addicted since. But this Porridge looks also great – I have to find some raw buckwheat now, so that I can try it! I just want to say that I’ve been going through a pretty tough time recently. My life seemed to be in order and I was achieving what I wanted and then everything was turned upside down. I am trying not to think about the past and concentrate on the future, some days are so much easier than others, other days I wonder how I’m going to get through things. I know that I can go to your blog for inspiration when I am down, it’s good to know that everybody has down days from time to time, I do like to think of myself as a positive person. Keep up the good work. Thank you Jenn. I wish you all the best with your difficult time. I know things will work out for you…keep the faith! Mmmm that carob puff cereal looks sooo good, I’m addicted to carob this summer… I think I almost like it more than chocolate now! Never thought I’d say that :). I have bought the Kamut Puff cereal and by its self its so bland, its a great idea to add some carob powder. I just had an idea, if you add chocolate protein powder instead of carob powder you wouldn’t be able to eat 85-95 bowls a day but it would be a lot more filling and maybe qualify as breakfast! I have also been meaning to make your buckwheat Porridge but I too have run out of groats, I’ll have to pick some up soon. I have been sprinkling them on top of my VOO for a little added crunch. 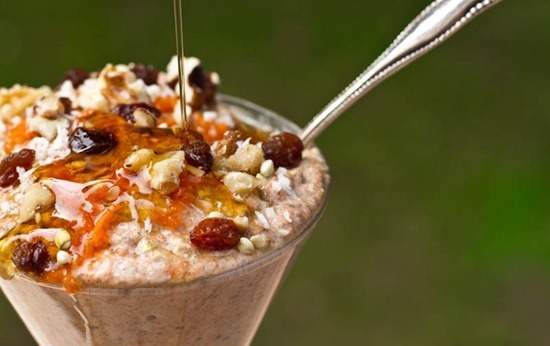 This look so good … just made your porridge the other day ! 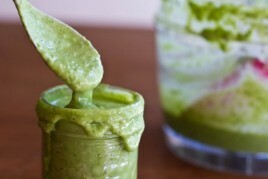 I am about to soak a new batch so I can have this for breakfast in the morning :) Thanks !! I didn’t really see anyone comment about making the carrot cake buckwheat porridge and its turnout so I thought I would. I just made it and it’s pretty good, but I had to add more maple syrup to it, and I found that there was a bit too much spice, especially the nutmeg. I love buckwheat but even after blending it for a long time, I found the grittiness rather unpleasant. I’m vegan and familiar with raw food but I probably wouldn’t make this specific recipe again (I’ll probably make the oatmeal version which I’m sure is to die for!) Still, it’s a pretty neat recipe. For pics and review on it, you can hop over to my healthy vegan food blog UnReFiNeD http://nocrapdiet.wordpress.com to check it out. Thanks again Angela for your recipes and your inspiration! I really love your blueberry maple muffins! yes your raw buckwheat porridge has been a mainstay in our family…i even got my 9 & 7 year old loving it! Ok stupid question…but how do you cook buckwheat groats? I have to find them first…that should be a challenge and a half! I am still searching high and low for umeboshi plums….any idea where in NB you can get these? ANyone? Hey Mary, are you near a Whole Foods or Mrs. Green’s? I’ve found the plums at both locations. I live in NY and have a lot of options, what’s available near you? Sorry Maura! Misread your name, my apologies. I love sprouted buckwheat. I make carob buckwheat crunchies for toppings. Just posted about one recipe a day ago. Yummy!! I love kamut puffs with almond milk for a snack. I usually add cinnamon, but I am going to try the carob powder. Sounds delish! Why did I never think of that?! I was just waiting to hear……………. This looks so good but I happen to have a huge container of kasha right now. Do you think I could sub the Kasha for Buckwheat? Made your recipe of carrot cake today!!! Thanks sooooo much. I’ve had this…two days in a row. And I’ve already made one for tomorrow morning. I didn’t have buckwheat on hand, so I used rolled oats. And I didn’t have carrots, so I’ve been using fruit, blending it with the oats, not grating it. And I’ve been using flaxseed instead of chia, because I have no chia. But I LOVE it. The thickness, the sweet spices, the wholesomeness, the way it makes my belly feel content. Yesterday, I added a large handful of spinach. Looks funny, but tastes the same. I like having greens in the morning if it fits inside my breakfast, just incase I don’t get to eat them later in the day. But now I don’t know how I’ll ever have another kind of breakfast, ever. Nothing else sounds and tastes as good as this! Ha ha, I do the same thing but with Natures Path puffed brown rice or corn and Vega choc-o-lot instant smoothie. Sinless and delightfully healthy. Loved the carrot cake taste and the crunch, thanks! My immersion blender was a good tool for this, I could blend some, not all of the buckwheat groats in the same bowl, so less to clean up. Will enjoy several days of breakfast with this, I think. 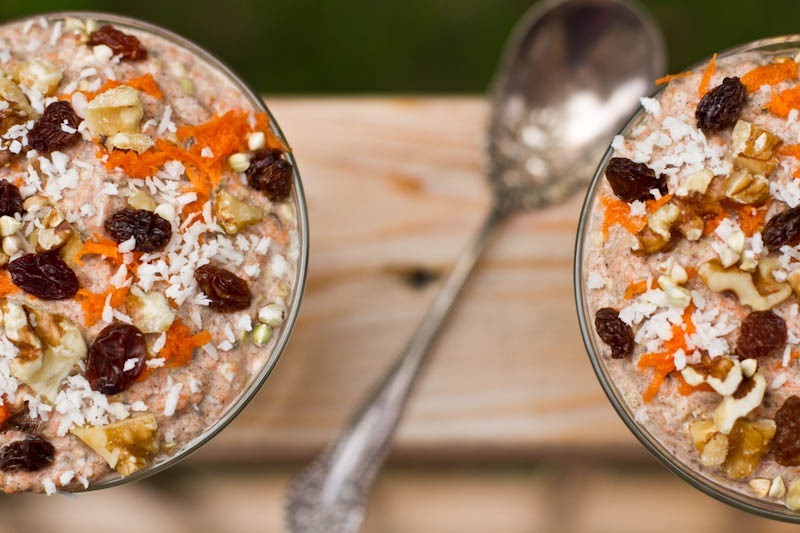 Definitely loving the looks of the carrot cake buckwheat porridge. is extremely triggering for us trying to recover. Hi Hannah, I’m so sorry that my story was not very sensitive to those still suffering. Reading it over now, I do see your point. I have edited my post to be less triggering. A little late to the party, but just wanted to say the buckwheat porridge is *excellent*! I did add a bit of salt, but the porridge was pretty tasty even without salt. Thanks for the recipe! I was wondering if any grain would work with the carrot cake porridge like wheat berries or whole oat groats. I hate hate hate the taste of cooked buckwheat. Perhaps it’s not so bad raw like that. Previous post: Vegan Recipes and a Glo Bar Giveaway!